Everyone needs slim fit jeans in their lives! 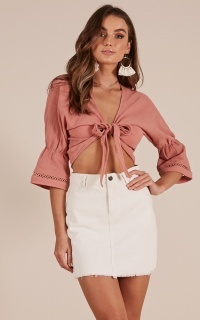 Pair this transeasonal must have with a crop top and a statement necklace for a bit of glam, or throw on a tee for a relaxed and effortless look. I can’t even fit one leg. I’m really disappointed I waited two weeks for this. I had planned to wear to an event. I have never seen a size two like this small before. These jeans are more like jeggings. The dark wash is very flattering but it ran a bit on the longer side. I'm 5'2 and measured my waist and was reccommended to buy the Medium, which did fit but ran long around my ankles. Theres also a lot of stretch! So maybe going down one size.